Case in point: should the scrollbar be taken into account for the vw unit? What about a site's navigation or page controls — should those count in the calculation? Then there are physical attributes of the devices themselves (hello, notch!) that can't be overlooked. But! If you start scrolling, it's a different story. Once you get past a piece of the browser interface, like the address bar, the vh value would update and the result was an awkward jump in the content. Safari for iOS was one of the first mobile browsers to update their implementation by choosing to define a fixed value for the vh based on the maximum height of the screen. By doing so, the user would not experience jumps on the page once the address bar went out of view. Chrome's mobile browser followed suit around a year ago. While I recently used this technique on a project and it really helped, you should always think twice when replacing the browser’s default behaviors. (For example, this comes up a lot with ::focus.) Also, browsers tend to update very fast these days, so beware that today's solution may not work tomorrow. Haven’t tried that yet but I struggled with that problem for months! Thank you very much will try this to fix my website soon. Could you elaborate your use case? You need an in-flow full-height element at the top of the page? That’s exactly the use case where I needed it. The first screen of the website was supposed to be full-height on mobile but we got the bottom cropped (which was the client’s logo). You could also use this trick if you have a modal that should be 100vh and you don’t want your users to loose the bottom part because of the browser’s interface. I wasn’t doing –vh in root but in that element that needed vh unit only and with jQuery as the project was in jQuery. But the concept is the same. Just a side node – probably it’s better to call variable –vh100, as long it is “100vh”, not a single unit. However there is a problem – if any script execution fails, JS fails to load or loading takes a long time, you’re going to have an unusable site. In this line: height: calc(var(--vh, 1vh) * 100); there is var(--vh, 1vh) where 1vh is a fallback. This is not really mentioned in the article but CSS Custom Properties can have fallback if the property is not defined. You could also add a default value on the root in your CSS. I use the following code, never had an issue with 100vh not actually occupying the whole height. This gets rid of the default behaviour. To me it looks like the issue you are having is caused by it. After that IIjust manually add margins and padding as needed. That’s very odd. Can you check this live demo on your mobile and let me know what you see? Here is a screenshot from Chrome on Mobile. As you can see 100vh refers to the screen without the interface. Louis, please ignore my first comment, after looking into issue myself I have discovered more than I had hoped for. I always assumed that viewport height would be.. you know viewport height. Not the the mess it actually is. So I have been researching a bit.. it appears that only solution that is somewhat reliable is the one you write about in your post maybe with some media queries… I am currently looking into it. Meanwhile I made a little demo which seems to work fine, sort of… Ill try to use orientationchange event listener to handle the change of orientation and manually adjust height of pages which are below first 2 screen heights, because the URL bar will be always hidden at that point. THANK YOU – this issue has irritated me for ages, and it seems obvious now but it actually never occurred to me to solve the problem this way using innerheight. I wouldn’t recommend using the resize event though since the height of the element is then forced to change as you scroll on mobile(especially evident on safari ios). Meaning if there’s a background image on the element that is set to cover it makes the background position change, and will also affect any absolute positioned things inside that element too. I am running into this issue on an aside with a sticky footer. I always want the footer to be visible since it contains the cancel and submit buttons but depending on scrolling it might show correcrly and it might not. Do you have any suggestions on a sticky footer in an aside on a mobile device? Just in case somebody else runs into this issue, apparently in Chrome, window.innerHeight doesn’t return the correct viewport height if you’re in Device Mode in Dev Tools. 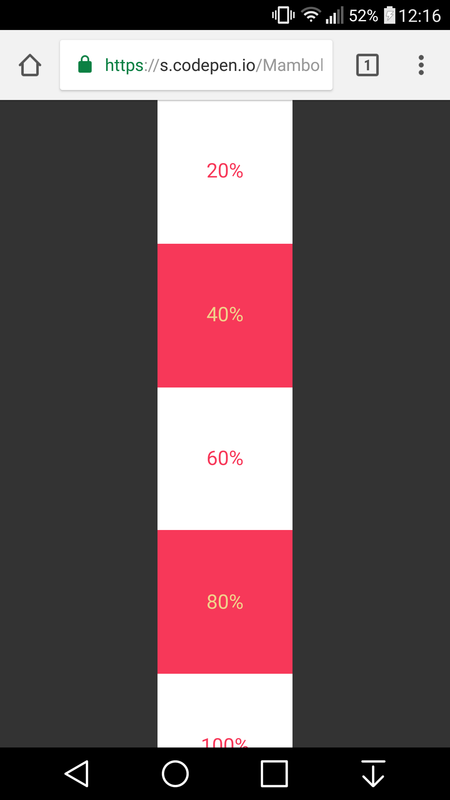 I was trying to use this method on a personal website of mine but was stumped when I went into device mode to check how it looks on iOS and the console log showed a different value for innerHeight then the device viewport height. Firefox and Safari showed correct values but Chrome did not. I needed to console log window.visualViewport.width if I wanted Chrome to use the visual viewport of the device. 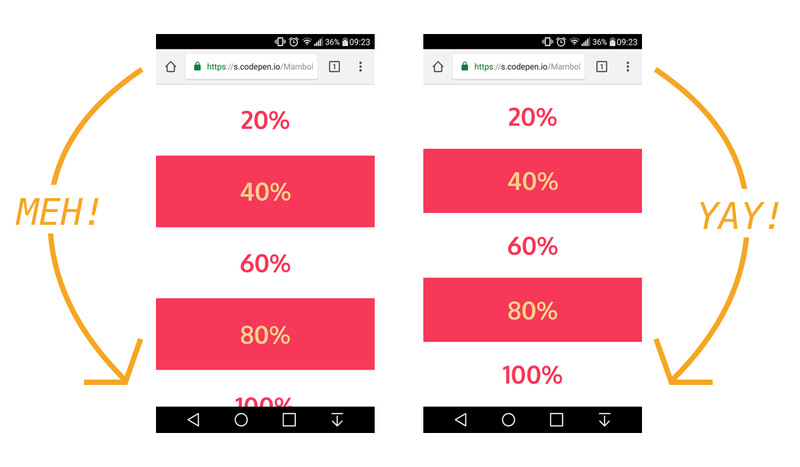 But if you’re actually on your mobile device innerHeight works fine, it’s just that when you’re emulating a mobile device on your laptop in Chrome dev tools innerHeight is not going to work as you may expect. Just nitpicking but might as well swap that let for const.